The Audi 5000 (100 to the rest of the world) is one of the most famous Audis, for better or for worse. Thirty years on, it still looks fantastic and serves as a reminder of what Audis look like before they started getting all covered in LEDs. The current A6 is a sharp-looking car, but its predecessor is still just as, if not more, attractive. These days, I can go days if not weeks without seeing a 5000 on the road. A few, however, have been lovingly preserved by old people and/or Ingolstadt devotees and I’ve selected a couple of especially nice 5000s that have interesting characteristics. I’d love to steal both for my garage. But, you know, that’d be crazy. I don’t think I’m in the minority here but I absolutely love the 5000 Avant. This is a remarkably stylish wagon, never mind that the sharply sloped rear window means it’s more like a hatchback. The big glass rear and sharp angles just look awesome, don’t they? It’s as if the designers were told to make a commodious rival to a Mercedes-Benz 300TE and then decided to make it as impractical as possible. 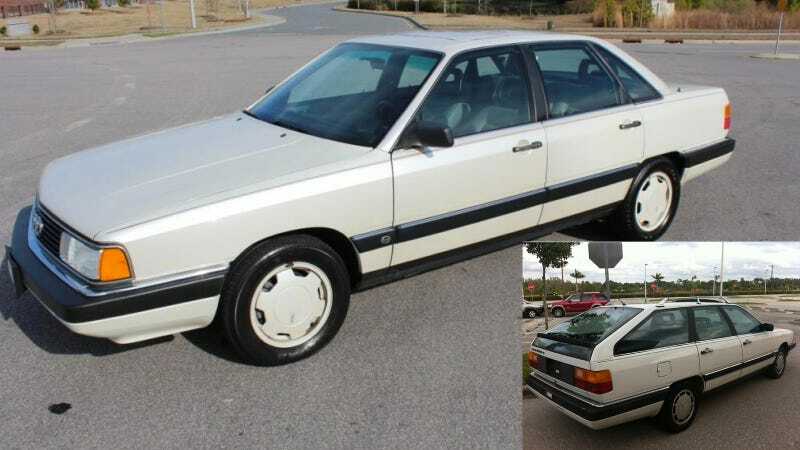 You bought a car like this 1986 Audi 5000S Avant if a Volvo 760 wagon was just too common. And rectangular. You know this one was owned by an old person in Florida by looking at the blue velour interior, the AAA sticker on the back bumper and the 68,000 miles on the (likely working) odometer, all for the low low price of $5,500. It does look like Grandma’s Audi and I like that. It’s the sort of thing my grandmother would’ve had in 1986 if she didn’t buy a Saab 9000. However, she knew to get a turbo, unlike this 5000's owner. It has the 2.2-liter naturally aspirated five-cylinder, warbling out 110 horsepower. And I haven’t gotten to the worst part yet – it’s through a four-speed automatic. Yikes, it’s going to be slow going. Which is where this 1988 Audi 5000CS Turbo Quattro comes in. That’s a long name, but it has all of the right words. Whereas the Avant is a front driver, this CS gets the trademark Quattro system that was what Audi was really known for in the ’80s. The 2.2-liter five-cylinder turbo in this car also developed 162 horsepower and was mated to a five-speed manual. Now we’re talking. I also like the way this particular 5000CS looks, with the gray leather interior and white paint with equally white wheels. These are all colors I hate on many other cars and yet it looks really good on this one. I love the weird pictogram on the lower dash telling you what the Quattro system is doing and where the power is going. Why can't you get that on an Audi today? Everything looks really good on this car, especially the 38,000 miles it has. Which explains the nearly 10 grand asking price. But, hey, for the price of a 10-year-old A4 1.8T you could have this 5000 that has nearly as much power from a trademark five-pot and is just so much cooler. White wheels, I remind you! Between these 5000s, though, I really want the Avant. I’ve loved the look of these cars for as long as I can remember and I am a certified wagon addict. But this turbo-less, auto-equipped one just doesn’t hold up against the very pretty 5000CS I’m comparing here. If I were looking for a collector car and suddenly found $10,000 in my couch cushions, I’d spring for an ’88 Audi. I am probably that insane.